I wanted to tell you about something I did on a home sewing site but it is a bit off topic. There’s a big sewing forum called Pattern Review. It’s huge, over 200,000 members. I only read and participate in a few threads because I don’t understand a lot of it. The site has a weekly feature called “expert chat” where a home sewing authority is invited to answer questions. It’s a premium feature, only paying members have access. Anyway, I was invited to host an expert chat on the Pattern Review site Sunday before last. What sewing steps do you consider processing? Any tips for reducing the processing time? …isn’t all the processing mostly a product of almost always making something different? Or should we be using more or less the same patterns all of the time, just changed for style? Are there any other steps in the home sewing process, such as stay stitching, that you feel are not necessary? Are there really industry “secrets” to sewing faster, or is it just a matter of work flow? Sophisticated questioning or no, I can’t answer several (1 & 4; 3 & 5 are in my book) of them very well because I do cannot know the shared skills or methods repertoire of the audience. I would have to know how home sewers are doing things and with what equipment before I could recommend a course correction. It is close to an impossible job because no two people do things the same way -which is also similar to many of you. In home sewing, individual variations are nearly always supported and encouraged, amounting to a strategy of social cohesiveness rather than the goal of functionalism or efficiency. The experience causes me to remind you of the utility of standard work*. If we can -and we should- be able to agree on an optimal process, individual deviations owing to man, method, machine or materials are solved much quicker. The question I pose to you is, why aren’t these sorts of important questions asked here more frequently? *Dare I suggest it is useful to follow links in this post, particularly if you post a comment with objections? This has been happening a lot lately. Excellent chat, Kathleen! I’ve been meaning to tell you that I bought the same iron you did and also LOVE it. Excellent chat indeed! Kathleen, I use your zipper and welt tutorials all of the time! They want me to sign up before I can read the transcript. Even in school, they told us to use stay stitching, but that in particular doesn’t help anything except giving you a guide to sew next to. The things you have in your tutorials are way better than the home sewing ways I learned before I went to school. But in school, I learned a way easier method of putting elastic into a casing. Most patterns tell you to make the casing then insert the elastic with a bodkin or safety pin, but sometimes the elastic can stretch out and usually it’s a pain to get it in. The method they taught was to sew the ends of the elastic together, then sew that into the casing as you sewed the casing shut. Much easier to do. I have always wondered why domestic sewing methods vary so much to industrial methods, but I suppose it is so a beginner is able to complete the project adequately. Take staystitching – for a beginner it would stop them inadvertantly stretching an area they shouldn’t, but an accomplished machinist could omit it. And industrial methods usually assume some skill – eg skirt cuffs, slotting the sleeve into a preassembled cuff and stitching down, I’m not sure a beginner could do that well. A couple of things that I think should become standard work in home sewing circles is more fusing and more notches! That was really a good chat! I’ve been a member for a couple years at PR and have tried to read the expert chats, but there always seem to be alot of ” hi, your’e great, thanks for coming and then the next person who signs on will say the same thing?” , 5% new information before the guest speaker’s time is up. By now, my add has taken me to a different page. I find it a valuable site and I think Deepeka is a genius for coming up with the idea. I use it for a reference quite a bit, but I have never liked the chat transcripts, although the guests are extremely talented. But you did a fantastic job at keeping the chat moving and very informative! My first chat, read from beginning to end! Great Chat, Kathleen! I just read it. I also just ordered your book and will be lapping up information. A little sad though – I thought I invented the interfacing-instead-of-stay-stitching, and just recently. It started with a knit that raveled and frustration. Can’t wait to read. I don’t understand why a beginning sewer can’t or shouldn’t learn more efficient ways to sew to achieve a finished garment. What I can do on my industrial machine and what I can do on my home machine are vastly different. I think what happens in the home sewing industry is about novelty to stimulate interest and profit. Even in high school I knew those home ec classes were way off in what and how they taught sewing. So I became one of the self-taught and looked for sensible instruction when I could. I think it is a shame that you have to become a paying member of Pattern Review to access valuable material. What’s wrong with advertizing paying the way? If it’s valuable to you, why wouldn’t you pay for it? At $30 per year ($16.50 for six months) it’s not prohibitively expensive and less than the cost of a lot of sewing books. They do advertise, and that presumably helps keep much of the site free for non-members. Alison, Paying for information on the internet is like going to the library and finding out you now have to pay. I know the trend is more and more about paying but some of us grew up on the internet using it as a giant at home reference tool for free. I can even get, for free, what little news I care to read on the internet. I’m going to head this off at the pass and do not care to debate the matter of free vs paid content because it is a source of justifiable resentment. Donna, the library is not free. You pay for it indirectly with your tax dollars. The library provides services via budgets for book purchases, infrastructure and salaries. If I were so fortunate to receive a salary, health benefits and costs of maintaining this site, I would have no problem providing premium content at no cost to anyone. Even the Encyclopedia Britanica charges $69 per year for their website vs. $1400 for the physical set of books. Have viewed the info at PR over the years and participated in a few of their threads. I’ve been following Kathleen’s sewing instructions which have helped me as a home sewer. Do not have room at home for industrial equipment, so home equipment for now. Recently asked a sewing retreat instructor how to sew in some sleeves into a bodice. I had only 1/4 ” seam allowances instead of the customary 5/8 ” seams, so she could not help me. I knew how anyway, just testing the instructor. Do not want to make fun of the instructor, she only knows what she knows. Did mention this site to her as she teaches classes at the local community college. Libraries didn’t used to be free. Andrew Carnegie, the steel baron, was a big promoter of the free library and one of the reasons why we have them today. First, you can read the transcripts at PR with a free account. [I know, that’s what I have.] And if you don’t want PR’s once monthly newsletter, use a junker e-mail account when you sign up. As far as home sewers (no, I’m not going to use an alternate word), most people who learned home sewing in the last couple of decades learned by doing either patchwork quilting or home decorating projects, not garment sewing. And many of them drunk the Kool-Ade that garment sewing is very hard, and that mere mortals can’t possibly do well. Now add the “couture techniques” and “heirloom sewing” and “impossible to read vintage patterns”* to the mix and we have a large number of people who are afraid to sew anything that isn’t all straight lines. So we have a batch of self-appointed experts trying to simplify garment sewing, usually by adding extra steps to make up for lack of practiced technique. [Most durable fabrics don’t need stay-stitching if handled carefully and sewn properly.] Each “expert” teaches her own methods for having fearful beginners make a wearable garment, so we have lots of complexity substituting for a little skill. Now add that 95% of all purchased patterns aren’t worth the tissue paper they’re printed on, (I’m currently finding myself re-drafting a Kwik-Sew pattern that has no notches or other match points, and uses the shell patterns for the lining) and that home sewers are trying to make custom-fit garments, and we have chaos and disaster. * I’m not claiming that these techniques *are* hard, but that most people think they are. All part of the over-specialization of our society, but don’t let me get started on that rant. I am still not sure, whether industrial methods are the most efficient for a home sewer. The conditions are (I think, since I am only a home sewer) sometimes just different. A home sewer often has to do everything on one machine, without an additional serger, for example. Not all have a good iron and some do not even have a machine good enough to do a reliable straight stitch. Some materials may not be available or you need more special equipment to use the material if you get it. The rest is, I think, a matter of personality. Some people are just happy if they know one technique that works sufficiently well for them, other are more curious to try everything new they find until they have the perfect way to do it. I have been sewing since I was three years old and my first garment was a study in efficiency. My grandmother gave me an old sheet and I cleverly incorporated the hem into the hem of my sleeveless blouse. My garment was cut in one piece and even had a hand-worked button hole. I still have this first garment and I am well past retirement age. Just throwing this in for the humor! Sad to hear Kwik Sew is no longer making quality patterns. They used to be one of the better companies that I found. Have to agree that most patterns from independents and big companies could turn off a novice sewer. I think that nowaks nahkastchen covers many important points on this efficiency/home sewing conversation. I produce patterns for home sewing. It seems that I am continually trying to walk a fine line in my instructions, between familiar practices and newer, more efficient ways. Also, it is not as simple as, “Set up your sewing space for optimum efficiency.” Well, you can do that, but what happens in home sewing is that the minute you get set up for efficiency, your child falls down and starts crying, or you look out the window and there is a coyote on the front porch (yes, last week!). Home sewing is much more individual than commercial sewing, by its very nature. Using the 5/8″ seam allowance as an example, we know that it is cumbersome to use on a collar. In my earlier years, I thought I would teach the home seamstress how smaller seam allowances are better. I drafted this into the pattern, and used extra space in the instructions to explain why this was so. But it turned out that people were comfortable holding on to that little bit of extra fabric, and my wonderful idea became a hindrance to them. Now I use the 5/8″ seam allowance, and mention it in the instructions,when I think it is really important to cut it down. Sometimes I do make the seam allowance smaller, when I know that the other method will give unsatisfactory results, period. I make my samples on a home machine which is about 25 years old, in order to try to duplicate an average range of sewing experience. I use a regular ironing board, and an average iron. I think it is a base to start from, for the sewer. Some sewers will get excited about new machines, irons, techniques, and extend their interests in various directions besides just collecting fabric. I think of home sewing and commercial sewing as cousins, but not needing to be the same. 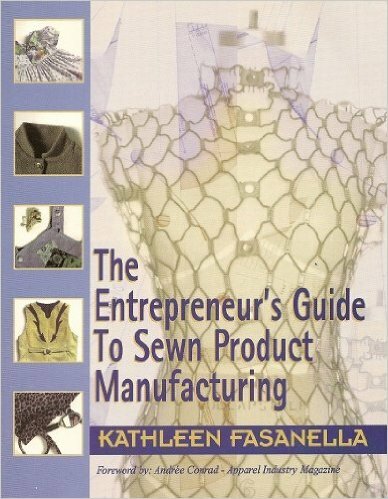 Kathleen is right about factory sewing having things planned out for simplicity of operations. Also, most factory shops specialize in a particular type of sewing. Uniforms, leather, wovens and knits are types of specializations often found. The one I worked in as a college kid was set up for wovens and went broke because they took jobs involving uniforms and knits when work was short. They weren’t properly set up for those sewing functions and things went badly (and expensively) wrong. Factories are not jacks of all trades while a home sewers tries to be. Regarding PR, I like them and do get frustrated not having access to more of the site. Previously I was too broke to pay, so it wasn’t an option. More recently the question has been whether the content is worth while for an advanced sewer. I think that part of the problem with home sewing patterns is, ironically, standard work. In that they have a set of procedures they draw from when they write up the pattern instructions, and they don’t have a lot of room to maneuvre. Introducing new techniques would mean the infrastructure and culture established over many, many years would need to change as well. That’s a lot of sewing books suddenly made obsolete, and many authority figures left looking foolish, and many “trained” home sewers whose habits won’t work with the new techniques. I also suspect that the methods used are often the easiest to illustrate rather than the easiest to do. They have limited space for instructions, and have to use the technique that will give someone trying to work it out on their own the best chance of success, assuming that the instructions are the only guide they have. I do agree with Lizpf, that home sewers have been led to believe that making clothes is difficult. However, the post before Standard Work linked to above, titled “The Real Value of Couture”, suggests that expensive designer clothes help maintain the perceived value of clothes, and maybe there’s a similar mechanism at work. By assuming making clothes is difficult, people are prepared to pay more for them ready made.